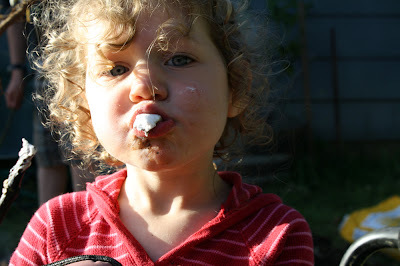 My friend Ida's youngest child is on a gluten free diet. I asked her if she'd be willing to share a couple recipes that have worked for her and she gladly obliged. These recipes have been tested and reviewed by some tough critics- her own kids (and even me on the bread recipe!) Everyone gave a hardy thumps up. So if you are on a restricted diet or are even just trying to reduce your daily gluten intake then I hope you'll try these recipes. In small bowl, combine yeast, water and honey. In a second bowl, combine flour mix, xanthan gum and salt. In a third bowl, combine eggs, oil and vinegar; whisk together. Pour flour combo into a mixing bowl and add both of the liquid mixes. Blend for 4 minutes in a mixer. 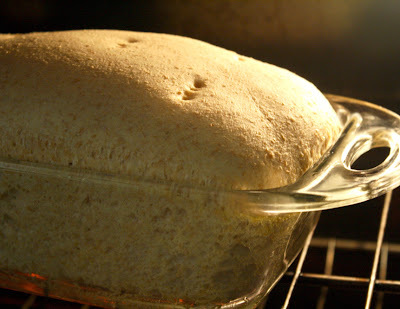 Scoop dough into greased loaf pan and allow to rise until 1” from top of pan; about 30 minutes. 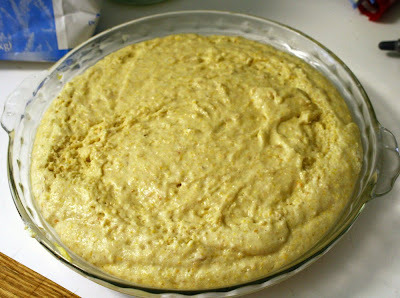 The dough will rise more while baking and if allowed to rise all the way to the top of loaf pan, it can spill over. I have to apologize that I have no finished pictures for you, but let me assure you that this bread is by far the best gluten free bread that I've ever had. It does not rise into a large round loaf but the texture is as close to "real" bread as I've ever tasted- none of that yucky, dense, wetness that you find in store bought gluten free breads! Today my favorite bread is my cat head biscuits I made for breakfast. Then, I added home churned butter and blueberry jam made yesterday. Tomorrow, I'll make brown bread and that will be my favorite tomorrow. Congratulations Sandra! Later today I'll have a few gluten free recipes for you that actually taste good! Stay tuned! I was just thinking this morning, while I was in the kitchen, about how much of my day is spent in it. For example yesterday I did the dishes, baked bread, made tortillas, soaked granola, made baby food, made breakfast, lunch and dinner, mopped the kitchen floor........ all of that simply in one room of the house! 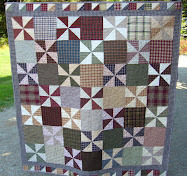 It got me wondering, how much time does a homemaker spend on average in the kitchen each day? I added a poll over to the left for you to vote. Let me know, realistically, how much time you really spend- I'm anxious to hear! When we got our Buff Orphington chicks this spring they were supposed to all be pullets. We got 6. My favorite one we named Henny. 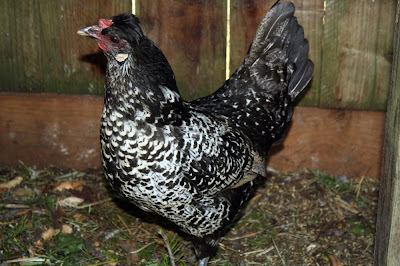 Yeah, I know, not so original for a hen but that's what we called her. As she grew my hubby started to say things like, "She sure looks like a rooster with that big red comb.I think you have a Kenny instead of a Henny." I reminded him that I had bought female birds and that we had had a hen or two (actually maybe 3) before that had large red combs. 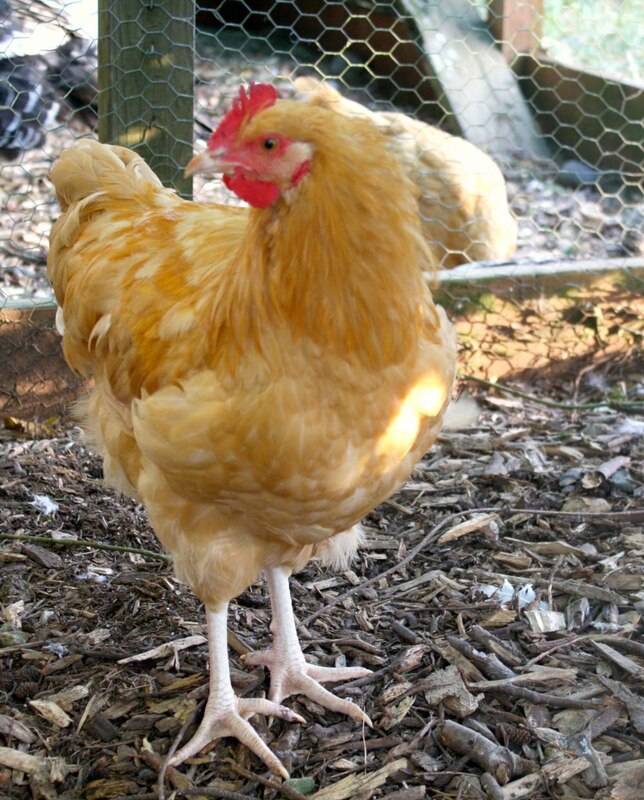 We even compared her to our older BO hen that also had a bright red comb. "See, I said, Henny is a girl!" Plus she was always the most friendly of all the chicks. She'd run right up and let you pick her up, hold her and kiss her and squeeze her. Well, o.k. we really didn't do all that but she was very sweet. 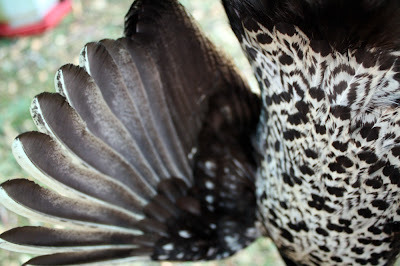 See, I've always looked at a chickens tail feathers as my first tell tale sign that it was a rooster. They start to curve very early on. The problem is Henny didn't have tail feathers. Yesterday though Wyatt came in and said, "Um, mom there's no doubt about it now." Notice anything growing around Henny's lower leg???? Oh well, so much for having all hens. I got to thinking about it and it really is a blessing that she is actually a he. 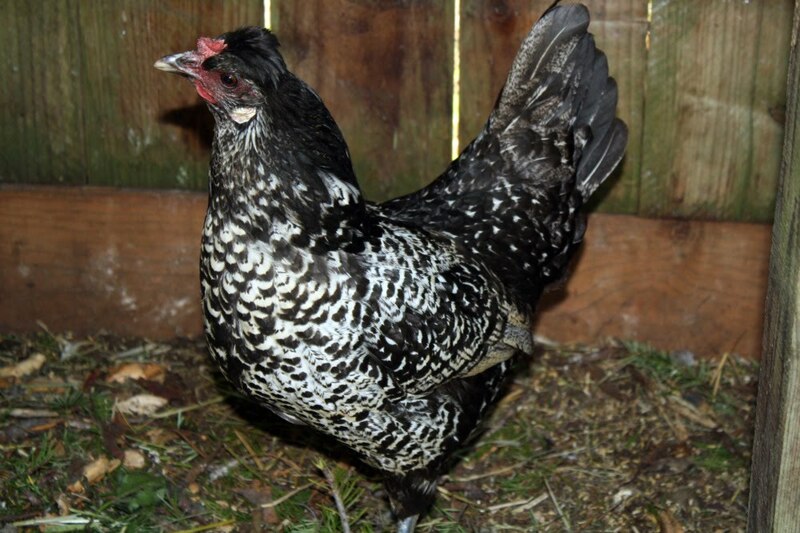 We wanted to get a BO rooster in about a year. I was dreading having to raise baby chicks again but now I'm not going to have to! I am still having problems though addressing him as a "him." I go out to the chickens and still call, "Come on girl." I hope I don't give him a complex. Do you have kids? Or have you raised children? Do you make your own hamburger patties (instead of buying those preformed ones?) As a mom, I have always made our hamburger patties and when I make them for my kids I make them small. Maybe 3" in diameter. Because really, my kids aren't going to be eating huge hamburgers, they're 2 and 3. Cutting a regular burger in half always resulted in them thinking they were cheated somehow. 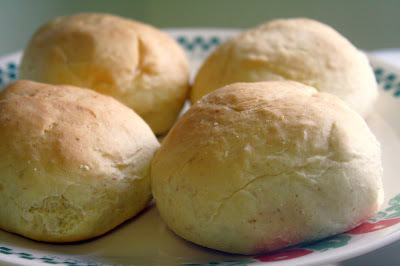 I forgot to take photos of the buns the night I made them so theses were the leftover small ones. 1. Heath milk, water and butter in saucepan until just warm. 2. In a mixing bowl combine 1 3/4c flour, yeast, sugar and salt. 3. Stir the milk mixture into the flour mixture and combine. 4. Add the egg and mix in. 5. Stir in remaining flour, half cup at a time; mixing well after each addition. 6. Knead for about 8 minutes. 7. Pull dough into 12 equal portions (or make up your own sizes) and shape into smooth balls. 8. Place balls on parchment lined backing sheet and gently press down on each ball to flatten slightly. Let rise in a warm location for 35 minutes. 9. Bake at 400 degrees for 10-12 minutes. Happy Father's Day to my Dad today, to my Grandpa today, to my Husband and to my Father in Heaven, Holy is your name Lord! I mentioned this month that my favorite yeast to work with is SAF yeast; it's great! Have you tried it? Would you like to? Here's your chance. I'll be giving away 1 pound of it starting today. 1. For one entry, leave a comment here about your favorite type of bread. Giveaway is open until 7pm on June 25th. Winner will be announced on June 26th. Happy baking! 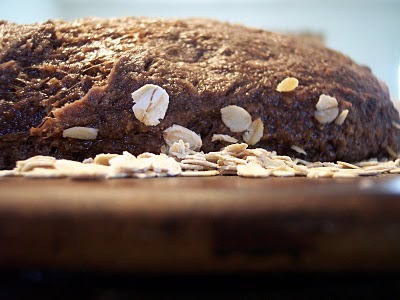 I love rye bread and Evelyn Fields bakes up a delicious loaf in this post. I hope that you enjoy it! Just warning, the recipe I'm sharing is complicated but I believe makes a really digestible bread. 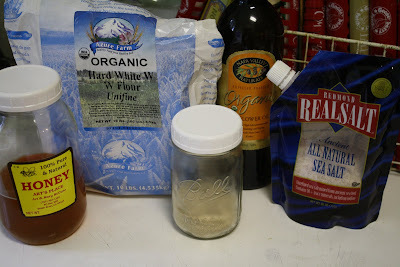 I started with this rye recipe that is easy to follow & has great pictures. It you don't have a lot of bread baking experience, I would start with the linked recipe. 2.In another bowl, mix 3.5 cups flour with your sourdough starter & just enough water to mix (save 1/2 cup of flour for kneading). 1.Drain soaked grain & blend in food processor(1-2 minutes). 2.In separate large bowl, mix all ingredients except soaked grain. 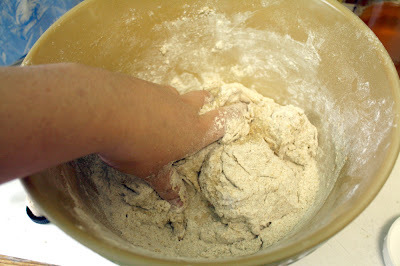 3.Once well mixed add grain in & mix with hands & form into a gooey ball. 4.Liberally flour cutting board & roll your gooey dough ball around on it to well coat the outside. This is not a typical knead, you just want the outside of the dough to dry up a bit from the flour. The inside of the ball will still be very moist. 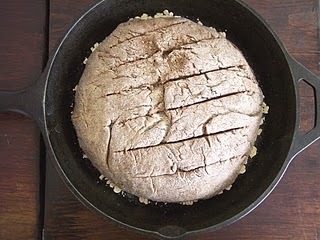 5.Sprinkle oats on cooking stone (I tried it on the stone & in the cast iron pan but I liked the stone better.) & place dough on top. 6.Place in oven for 1 hour on warm. 7.Turn oven up to 210 degrees & bake for around 4 hours. 8.It is done when you can push on it & it feels done & the inside temp is around 190. *This bread doesn't really rise so it is pretty dense & moist. We used if for sandwiches & with butter. It is very flavorful & hopefully keeps a lot of nutrients from not being cooked at a high temp & all the soaking. Good luck on your baking adventures. The rising process is a simple one provided you have the right conditions to rise your bread. Bread dough likes warmth. Our house isn't very warm. Unless it's winter and freezing outside and I have the wood stove pumpin', then I'd say our house stays on the cool side. So I rise by bread in the oven. If your house is warm you can just rise your bread on the counter top. I turn my oven to 170 degrees (because that's the lowest mine goes) and then after just a few minutes of it heating, I turn it off. I turn the oven light on to maintain the warmth inside. You should be able to touch the inside wall of your oven and have it feel warm, without burning yourself. If you can't comfortably touch the sides then it is too hot. Rising in your oven also keeps away any drafts. 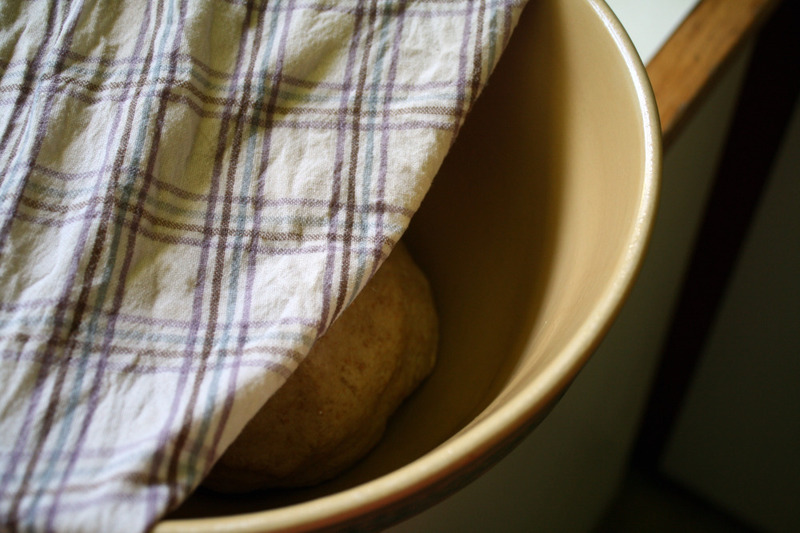 Place your bread dough into a greased bowl and cover with a damp washcloth. 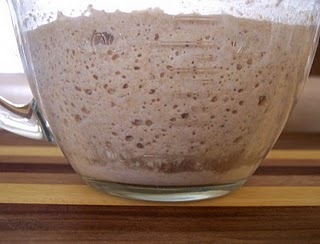 Allow dough to rise for 1- 1 1/2 hours or until doubled in size. Remove your dough from the oven and punch it down with your fist. I knead mine a little more right inside the bowl before letting it rest. Grease your baking pan well while the dough is resting, then shape your dough into a flat loaf and place inside the baking pan. Put your dough back into the oven to rise again for another hour. Once risen in the loaf pan (the second rise)it should look like this. You're going to bake your bread at 385 degrees for about a half hour. I like to cover my loaf halfway through with parchment paper and foil to keep the top from browning up too much. After the bread has baked, I pull mine out of the oven and cover it with a dry dishcloth. I allow it to cool and then remove it from the pan and wrap it in the same dishcloth. I then place the loaf (and cloth) into a plastic bread bag. I find that the dishcloth keeps my plastic bag cleaner (so that i can reuse it!) and it doesn't seem to harm the bread at all. Slice the bread as needed, it will keep better that way. And since dough conditioners are not used in this recipe I'd recommend using your bread within 3 days. There is a reason bakeries sell "day old bread" for cheaper! 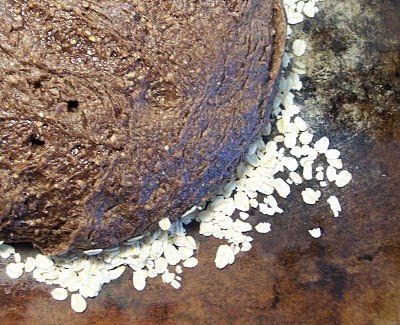 Baking bread at home is so rewarding and nutritionally better! I would love to hear about your trials and experiences if you'd like to share them! 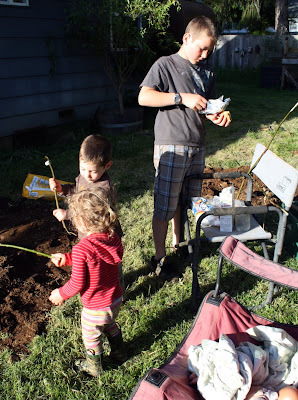 Here are a few shots from our Saturday night at the homestead. You'll be glad there are no photos of me. It has been windy here the past couple of days and the pollen is flying- which means me, with a runny nose and bloodshot eyes. Not a pretty sight. 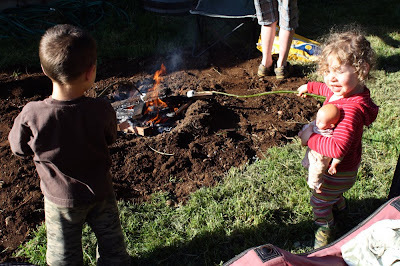 Yep, once in a while I do cave and allow my kids to eat something non-organic. I cringed when I read the ingredients on the marshmallows but I don't even think they make organic marshmallows, do they? And I certainly don't want my kiddos growing up not knowing what a s'more is! The things of today are preventing me from doing our regularly scheduled Rising and Baking post so I'll leave you today with a fantastic interview that I had planned for Monday. Then on Monday I'll finish up with Rising and Baking. This is a friend of mine, Ida. She is not only a great friend, but a Godly woman and an experienced bread maker. I hope that you enjoy this interview, I found it to be super helpful. Please tell us a little bit about yourself: I am a Christian, homeschooling, stay at home, mother of three. I have a wonderful husband that supports me and encourages me in all that I do. I am passionate about country living and nutrition. I am always trying and learning how to do new things that either make us healthier or enable us to live more economically. 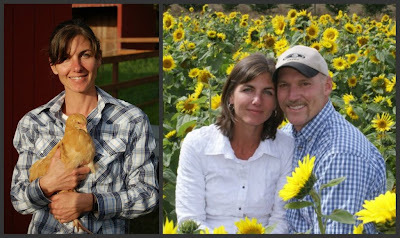 We are blessed to have a home on an acre where we raise and grow all that we can. 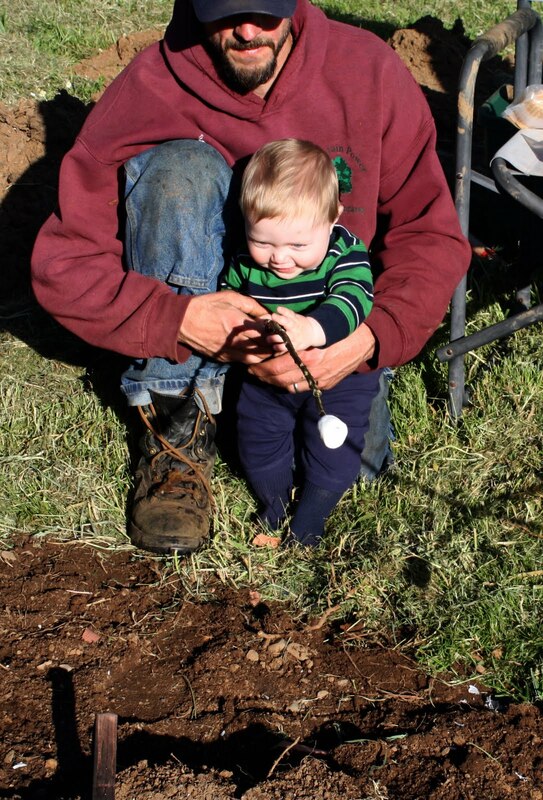 The things that bring me the most joy are gardening, horses, and spending time with my family. How long have you been baking bread? And what made you want to start? One of my first endeavors was baking my own bread. I had been baking bread for several years before learning about whole wheat and the nutritional benefits of bread made from freshly milled flour. Even though it required a little more work, I wanted my family to have the most nutritious and delicious bread possible. What types of flours have you used and which ones are your favorites? I have experimented with Kamut, whole wheat, pastry, coconut, almond, and most recently rice flour, sorghum, and tapioca flour. My favorite is Kamut. 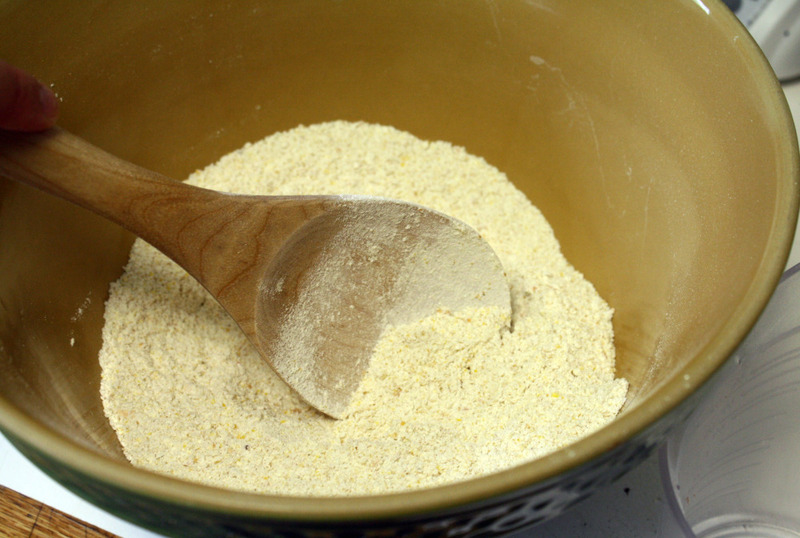 It is a very versatile flour that can be used to make bread as well as biscuits, pancakes, and cookies. It is light in texture and has an earthy, nutty taste. 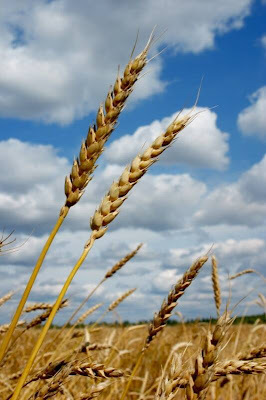 It is also said to be very high in protein, lower in gluten, and therefore easier to digest for some. Do you mill your own grains? Yes, I do. There are many types of grain mills on the market today. I would recommend researching and finding the one that best suits your budget and needs. I purchased the Kitchen Mill and it has been a great mill so far. I purchase the berries or grains in bulk and then grind them as I need them. 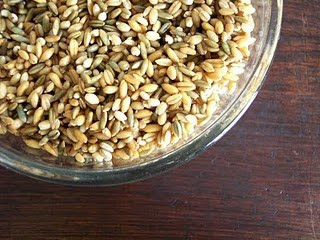 What about sprouting your grains or soaking your flours ahead of time? Is it worth it? Although it is an extra step in bread making, soaking or sprouting neutralizes phytic acid and activates enzymes making it more nutritious and easier to digest. 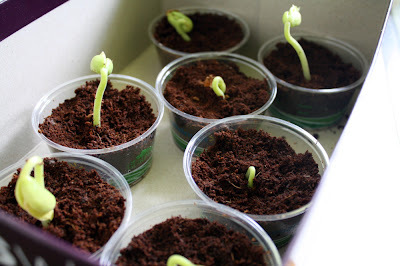 Sprouting and soaking also applies to legumes, nuts, grains, and seeds. Tell us about kneading. Some say you don’t need to, some say you do, some say for a few minutes, others say for 15 minutes- it’s confusing! What are your suggestions? Kneading is essential in my experience. It stretches the dough and develops the gluten. How long, depends on the type of grain you use and the texture of the dough you are working with. Each recipe is different but the general rule is around 10 minutes. Let’s talk yeast. What have you found that works? Do you proof your yeast? One important aspect of yeast is that it needs to be fresh. I store mine in the refrigerator. 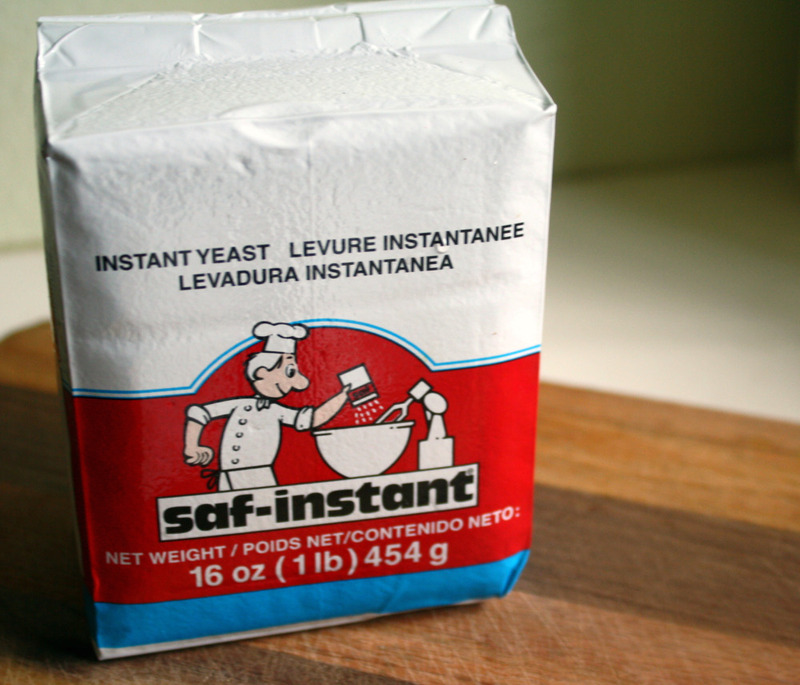 My favorite yeast is SAF instant and yes, I do proof my yeast. I mix the yeast with warm water and honey and let it sit while I combine my other ingredients. Proofing ensures that the yeast is active. Any helpful hints on rising your breads? A warm, draft free environment is critical. I also found that keeping the loaves from getting bumped is important. Once my loaves are shaped and set in their places for rising, I don’t move or touch them until I am gently placing them in the oven for baking. What type of pans work best for baking? I have used both glass and stainless steel. Both work nicely. With either one, be sure to grease the pan generously. Nothing is more frustrating than to have a perfect loaf ruined because it sticks to the bottom of the pan. What is the best method for storing your bread? When the bread is removed from the oven let it cool completely before putting it into plastic bags. I store our bread in the pantry. We eat it fast enough that mold is not usually a problem. I’ve found that the refrigerator dries the bread out. For long term, the freezer is the best for storage. How long does fresh baked bread stay good for? It should last several days if stored in a cool, dry place. 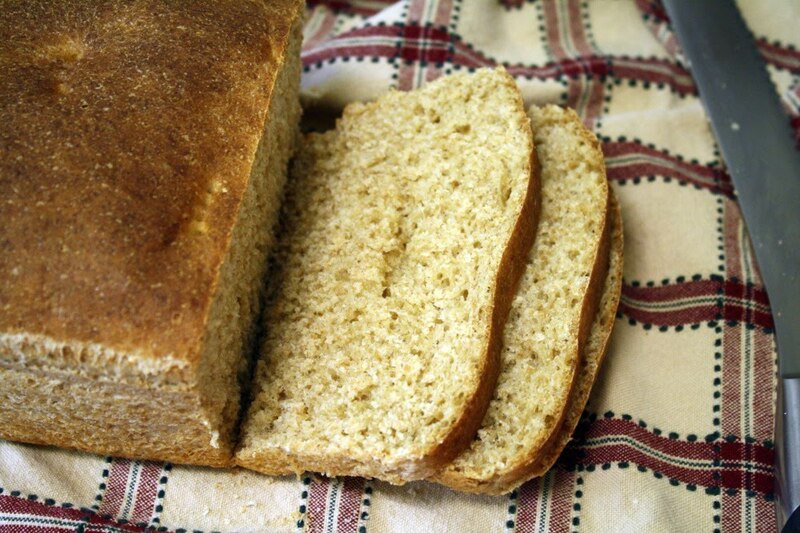 Homemade bread does not have all the preservatives so it will not last as long as store bought bread. Thank you so very much Ida for taking the time to answer these questions. I know that your knowledge will benefit all of us! 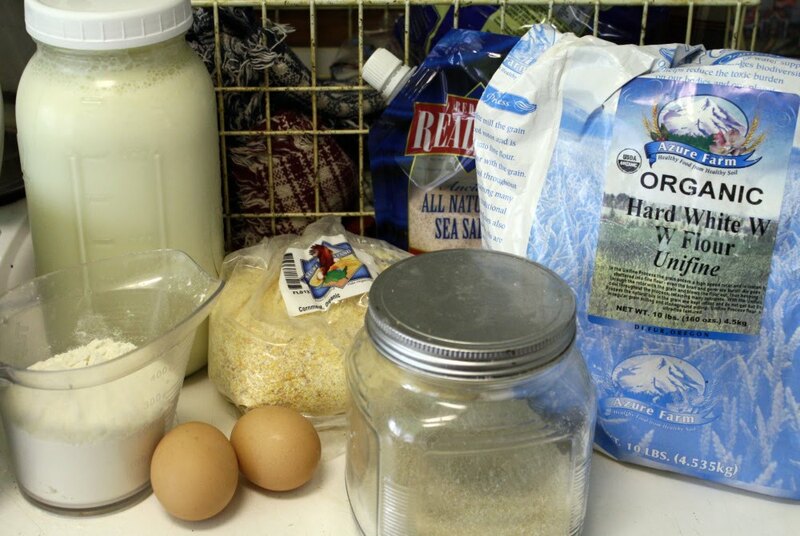 Now that you have your dough all mixed together, it's time to start the kneading process. If you've mixed your dough in a large enough bowl you can simply knead your bread in the bowl itself. If not, then turn the dough onto your counter for kneading. If you're using the counter then you can lightly flour it or pour a little oil onto the counter and rub it around to grease it. Kneading is a process that takes a little practice. 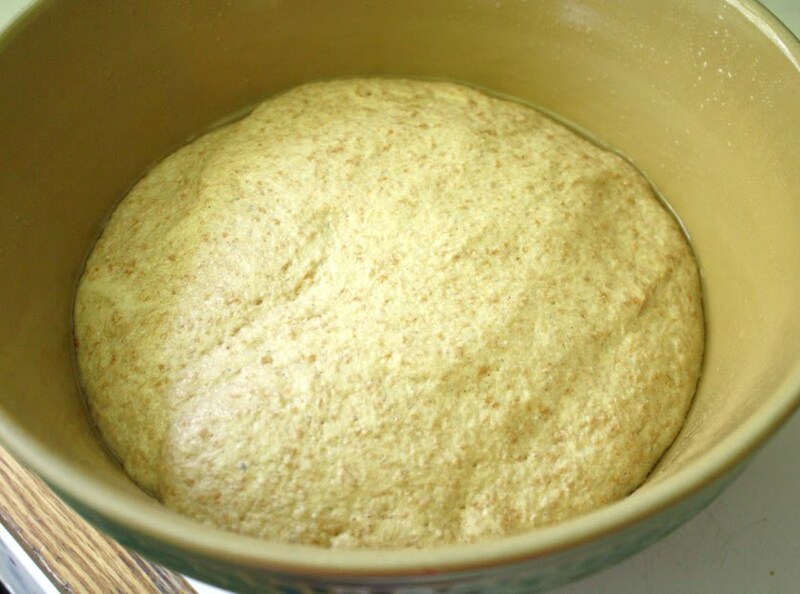 You want to make sure than you knead your bread dough just enough but not too much. Sounds complicated but it's really not. You'll learn to just "feel" when it's done. If you under-knead your bread then the gluten doesn't develop enough. If you over-knead your bread then it can turn out stiff as a board! You can knead with your bare hands or with a rolling pin. To knead with your hands simply pull the dough out and then fold it back over itself. Continue this method over and over. You can use a rolling pin to roll the dough out, fold it over 3 or 4 times and then roll it again and again. Using your hands though is more fun and doesn't require the clean up of more utensils. 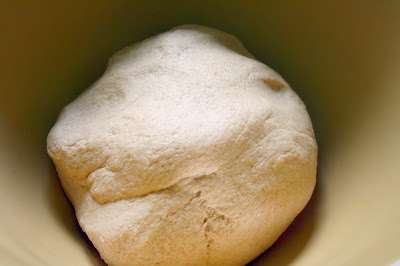 To test your dough for doneness when kneading, pull off a portion of the dough and ball it up. Then pull it apart. Does it break apart or stretch apart? You want it to stretch. Usually 8-10 minutes of hand kneading is all it takes. When you're done, place your dough into a greased bowl. This recipe is super easy, it only has 6 ingredients, and turns out well. The combination of wheat and honey gives it a hearty, sweet taste. Today we're going to cover Phase 1; Gathering and mixing your ingredients. Whole Wheat Flour; I use Hard White Wheat since it still offers enough gluten to allow the bread to rise/bake well along with a lighter color and texture thanks to the white wheat as opposed to the red wheat. Sea Salt; this is real salt, not fake salt like the table salts you'll usually find in your grocery store for about .65 cents a container. Honey; I like locally harvested, raw honey. Oil; I use organic sunflower oil for this bread, found at my local health food store at a very reasonable price. Stay away from conventional vegetable oils. Yeast; I use Saf yeast and have found it to be the best. 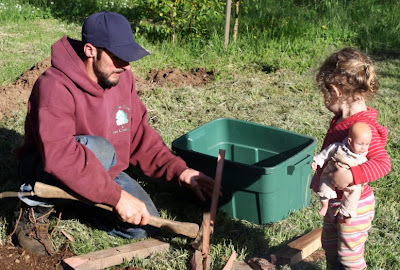 Warm Water; We're on a well so our water is free of chemicals and additives. I've never baked with treated water so I don't know if it would make any difference. This is going to make 1 large loaf plus a smaller loaf. We use the large one for sandwiches and the smaller one that night at dinner. In a large bowl and in this order, pour in 1 1/4c warm water (water that's about 110 degrees,) add 1 1/4 c flour, add 1/2tsp salt, add 1/4 c oil, add 1/4 c honey, and sprinkle 1/2 TB yeast over top. Mix with wooden spoon until well mixed. 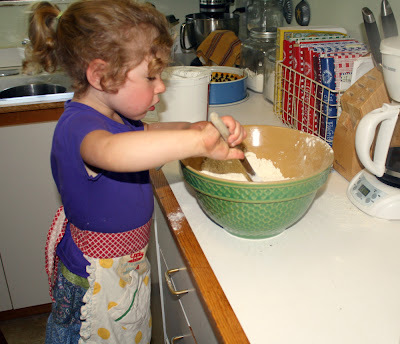 Gradually add (1 cup at a time) enough flour to bring your dough to a good consistency for kneading. I usually end up adding an additional 3-4 c of flour. It is going to still be sticky but not loose like batter. Tomorrow we'll move to Phase 2: Kneading. I hate to really call this a tutorial though because when I think of that word, I think of some in-depth, huge post that goes on and on and on. This is not one of those. Clipping a chickens wings is super easy and super fast. Why would you want to clip a chicken's wings you ask? Well, if your chickens are not completely free range (meaning they have their space but their space does not include ALL of your property) then clipping their wings is a easy and safe way to make sure they are staying in their space. While chickens can't fly like normal birds can, they still have an amazing ability to get up onto things. 6 foot tall things. 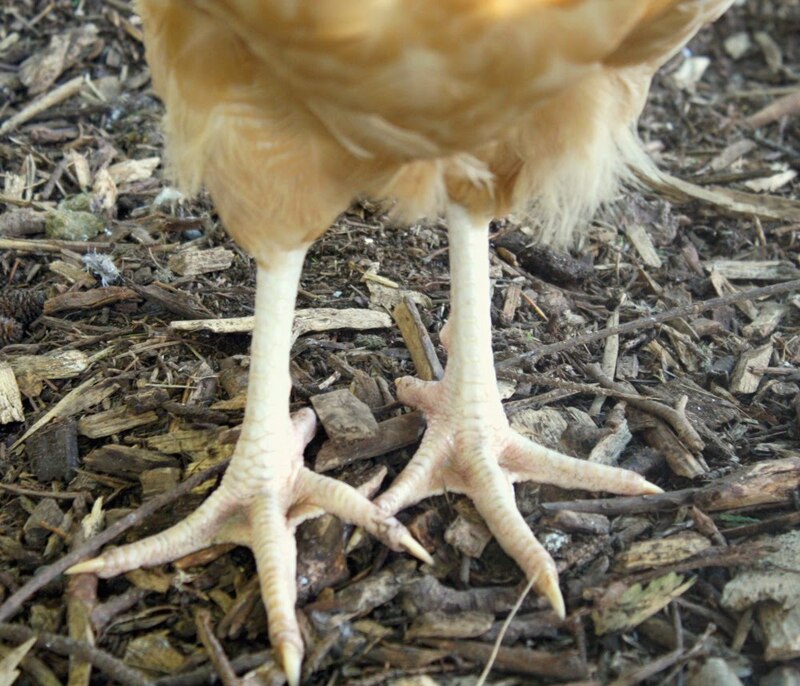 Fly over fences, leap a tall buildings in a single bound, ya know, they're chickens. Here's my handy, dandy helper, a.k.a. my son, Wyatt. 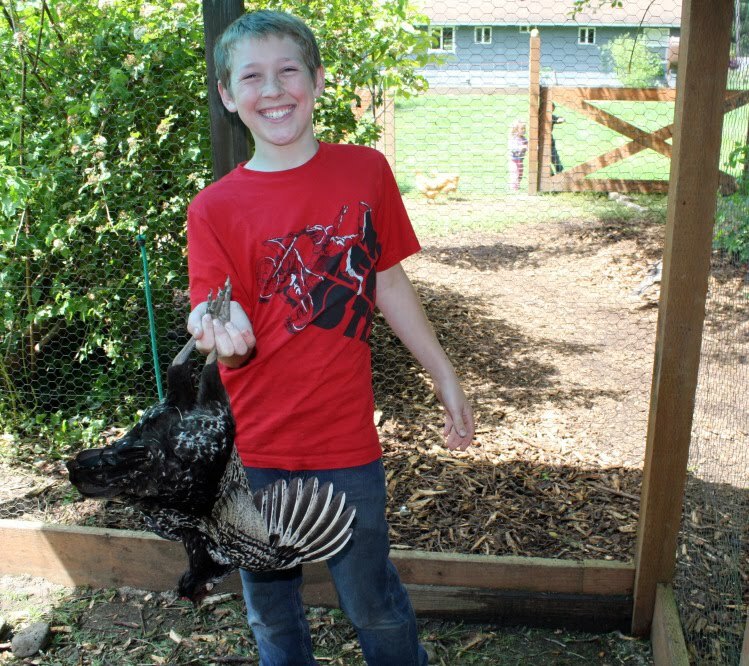 Yes, he is holding a chicken upside down. You can clip wings by just clutching a chicken like you usually would and then fanning their wings out to cut but we have a couple overly broody girls right now that would just assume peck you to death if you decided to hold them so we went about it this way. Plus, when you hold them upside down, they naturally fan their wings out for you. Additionally, they hold frozen stiff for the couple seconds that it takes to clip and then can be turned back over and placed on the ground. 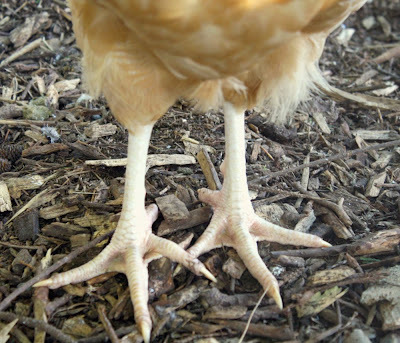 If you look at the above photo, I hope that you can see that a chicken has 2 sets of feathers on their wing. The first and closest to their body is their wing wing. Their cosmetic one. The one that makes them look pretty when they're standing still. It has other uses too but it is not the one you're going to clip. The second set of feathers is the longer set under the first row and are called their flight wings. These are the ones that allow them to get somewhere. These are the ones you're going to clip. They are usually a slightly different color as well, so that you can better identify them. 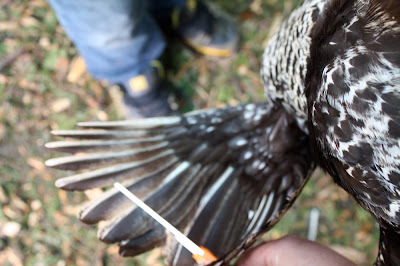 You're going to take your sharp scissors and cut off a few inches from the flight section of feathers. I like to be conservative to start with, clipping both wings. Maybe 3 inches. If your chicken can still fly up and over things then you can cut back another inch or two. Here's the thing- you do not want to cut too much off. Cutting the feathers too far back can result in cutting the quick. If you cut the quick on a chickens feathers and they start to bleed out, they can bleed to death. Like I said, don't be afraid to be conservative at first and then trim a little more if need be. Sorry that the photo is a little blurry but it didn't hit me until I tried to take the photo that holding the scissors and holding the camera would take both my hands and make it very difficult to actually push the button to snap the shot! A friend of mine told me that one of her chickens (she has many) could fly over a 6 foot fence even with her wings clipped. Yikes! Most chickens are not like that but I suppose there may be a few out there! And here is the finished product. Notice how clipping the flight wing does not change the appearance of the chicken. I realize that this post has absolutely nothing to do with bread making but I'm going to continue to post, in-between the bread making posts, about other things as well. Enjoy your day and let me know how your clipping goes! I originally started making sourdough starter here. I had found that recipe and tried to follow it. Through the process I've learned a thing or two and I'd like to share my experience and encourage you to start your own. When I first thought of making sourdough starter (which will just be called SDS from here on out,) I thought of making sourdough bread. We love sourdough bread and since the starter used to make the bread is fermented, I loved the idea of making it even more. Since then though I have found quite a few uses for my SDS. I use it in my tortillas, in my pizza crust, in my pancakes, in my hamburger buns, in my english muffins, etc. You can honestly use it in any type of bread product! Some recipes actually call for the SDS and some (like my pancakes) I just add it into. Pancakes are one of my favorite breakfast foods and while most wouldn't consider pancake making, bread making, I'm going to share my home concocted recipe for soaked pancakes later this month! SDS is super easy and fairly forgiving to make and keep alive. You can use my recipe that I linked to above if you'd like to. If you don't have all the ingredients on hand then you can also start a SDS with just flour and water. 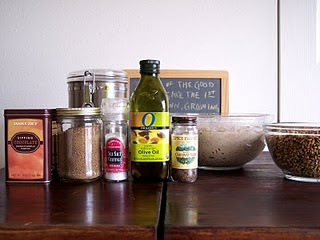 Simply mix equal parts flour and water together in a glass or crockery type container (you can use plastic, although I'd rather you steer clear of that, and can not use any type of metal.) You can feed your starter with flour and water on a daily basis, determining how much you add based on how much you're using. When I don't use my SDS often then I usually feed it with about 2TB flour: 1 1/2TB water on a daily basis. If it gets used then I may feed it with 1/4c to 1c flour: 1/4c to 3/4c water, depending on how much I just used. I like to keep my SDS on the thicker side, it seems to do better that way. I'd say a good thick pancake batter consistency. Using organic flour is a must for making and maintaining SDS the thing is, all flours do not work the same. I buy all our flour from our co-op, Azure Standard. Last month though I forgot (*doh! *) to order flour and I had to get by with buying organic flour from the health food store. It killed my SDS! I don't know why it happened but for some reason, the brand that I purchased was not SDS friendly. So keep in mind that if you do try making SDS and it doesn't seem to be working, before giving up, try a different brand of flour. And always make sure that your wheat flour is barely free. I know it sounds strange to thinking that when you buy wheat flour (whole wheat or white) that you would also be getting barley in it but read your label carefully, it does exist in some brands. If you have any questions about the SDS please feel free to email me directly or leave a comment here and I'll respond in the comment section so that all can see. We have some neighbors behind us that moved in about 2 years ago. 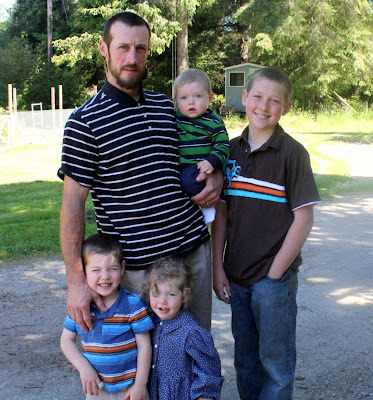 The husband and wife are both teachers and they have 3 kids. The wife just started gardening last year and I was happy to share some tips with her. That garden started our "swap." 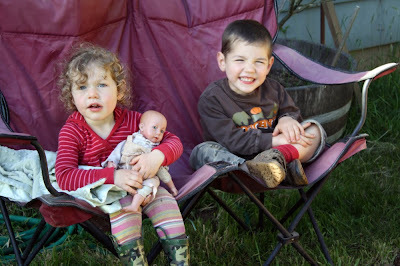 We would bring them extra food from our garden and they'd come up with something from their home to bring to us. Christmas time was full of swapping fun goodies. We share eggs with our neighbors and a few weeks ago I made more bread than we could consume in a day or two so Wyatt took a loaf, fresh out of the oven, over to them. Who doesn't love fresh baked bread? The wife then sent this over the other day with a nice thank you note. Nothing is necessarily expected for the giving, it's not mandatory to give back. We just enjoy doing it. It feels so natural and good to be neighborly. Do you have neighbors that you share with? If not, then this month as we experiment with bread making, may be the perfect time to start. Bake a loaf and take it over to a neighbor in need or one you haven't had the pleasure of getting to know yet. I wasn't going to start off our recipes this month with cornbread, of all breads, but we ate it last night so here we go! We love cornbread. And sweet cornbread at that. You'd think we're southern! But conventional cornbread recipes call for refined sugars, vegetable oils and cornmeal. Unless you have organic cornmeal then you're consuming GMO (genetically modified) corn. So I took a recipe, modified it to fit our diet and here's what I came up with. Everyone always raves about this cornbread and I honestly feel as though the fresh, organic ingredients make a huge difference in the flavor. In bowl, combine all dry ingredients and stir well. Set aside. In a small bowl, or large measuring cup, beat eggs slightly. Add in milk. 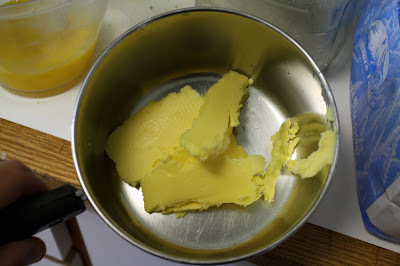 Slowly melt down butter in saucepan. I heat mine on the stove on low and watch it until it is just melted. 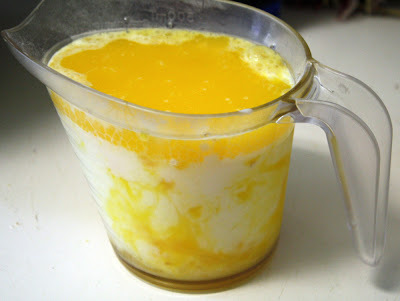 Pour butter into egg/milk combo and then pour into dry mix. Pour into buttered pie dish (I used a 9.5" on the one below) and bake for about 25-30 minutes. If you're new to baking breads then cornbread is a great one to start out with. It's easy to make and turns out well. You can make it without any sweetener if you'd prefer. You can also bake it in cast iron muffin tins if you'd prefer individual servings. If you're baking cornbread muffins remember to reduce the cook time to about 18-20 minutes. 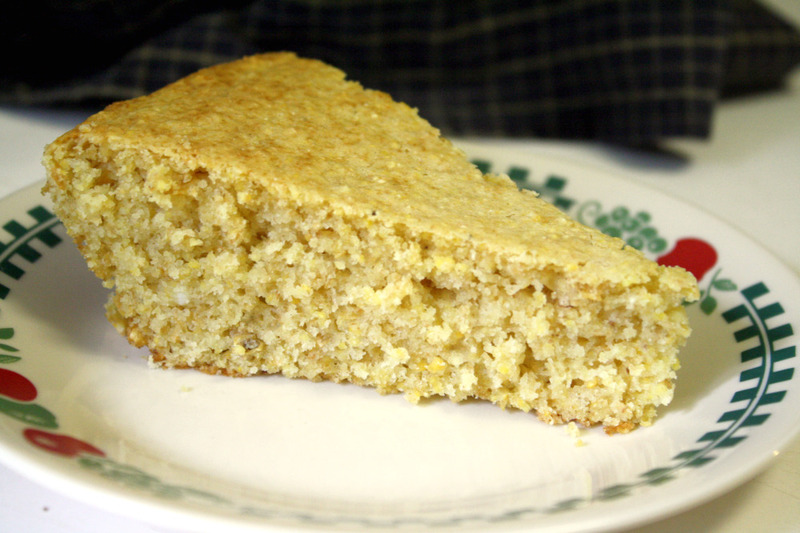 You can always test your cornbread with a wooden toothpick inserted in the center to see if it's cooked enough. When inserted, it should come out clean. Enjoy cornbread with meatloaf, stews, soups, steaks, or any other dish you'd like! Starting our month long series of looking into bread making, I thought it would be appropriate to first look, briefly, at the history of bread. Bread, in one form or another, has been one of the principal forms of food for man from earliest times. Bread, both leavened and unleavened, is mentioned in the Bible many times. The ancient Greeks and Romans knew bread as a staple. In Old Testament times, all the evidence points to the fact that bread-making, preparing the grain, making the bread and baking it, was the women's work, but in the palaces of kings and princes and in large households, the bakers' duties would be specialized. 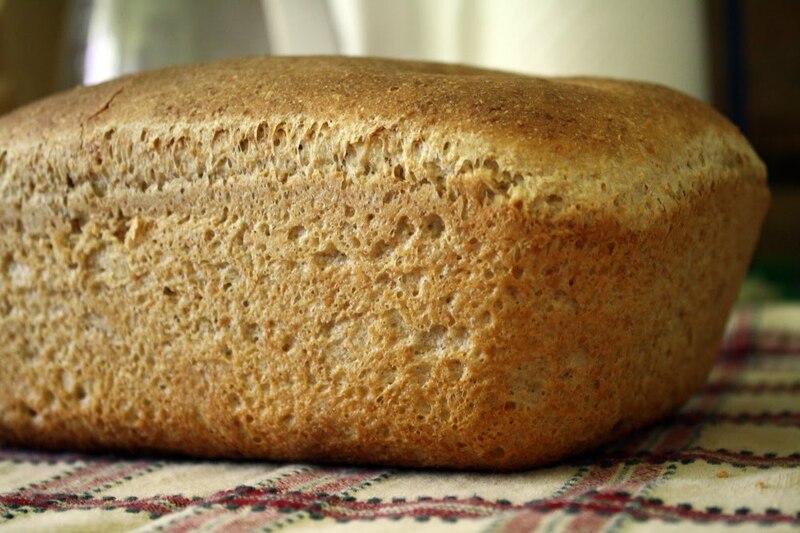 Bread was leavened; that is, an agent in the form of a 'barm' was added to the dough that caused the mixture to rise in the shape of our familiar loaf. The rushed departure of the Israelites from Egypt (thanks to Pharaoh,) described in the Book of Exodus, prevented their bread being leavened as usual. I read that, “Through much of history, a person's social station could be discerned by the color of bread they consumed. The darker the bread, the lower the social station. This was because whiter flours were more expensive and harder for millers to adulterate with other products. Today, we have seen a reversal of this trend when darker breads are more expensive and highly prized for their taste as well as their nutritional value.” and had to laugh at the reversal over the centuries. In doing some research on bread and flour I was surprised at what I found. Most of the information, available on the internet, had much to do with whole wheat breads, white breads and little else. Especially when it came to researching flours. While Whole Wheat and Unbleached White may be the common flours you see on your supermarket shelf, there is a wide range of flours that are useful (and even healthier!) for baking. Spelt Flour, Kamut Flour, Rye Flour, Bread Flour, Pastry Flour, and even flours such as Almond and Rice Flour, for those who are trying to maintain a gluten free diet. This month we’ll try different recipes, experiment with some new (to me, and hopefully to you too) flours, look at bread making methods and even have an interview with a seasoned bread maker. I hope you’ll enjoy this look into bread making!